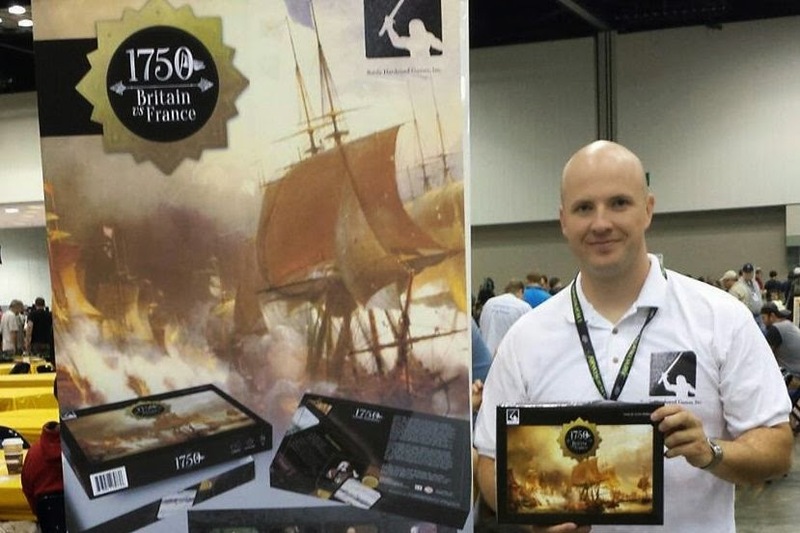 Jason Huffman with "1750: Britain vs. France" at GenCon 2014. PHOTO: Battle Hardened Games, Inc.
Like many soldiers, Iowa Army National Guard member Jason Huffman loves history, loves games and simulations, and loves learning about history through gaming. After months of game design, play-testing, and even demonstrating at the recent GenCon gaming convention in Indianapolis, he and his colleagues at Battle Hardened Games have launched a crowd-funding effort to bring their inaugural game "1750: Britain vs. France" to full production. Sample graphics from the game "1750: Britain vs. France"
The game "1750" is a 2-player card-based strategy contest, using both dice and cards to fight for control of the board. One player plays as Britain and the other as France, and each seeks to dominate the globe. 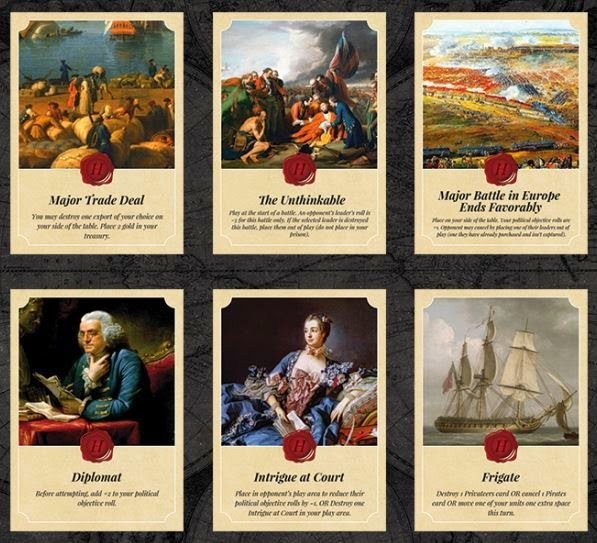 Players leverage historical events, land and sea forces, generals and admirals, supplies, and allies to control the North American, African, and Indian colonies in the years leading up the American Revolution. The graphics incorporate the paintings, maps, and other artwork of the day. A Kickstarter page for the project is here. A video is here, as well as below. A Facebook page for Battle Hardened Games is here. 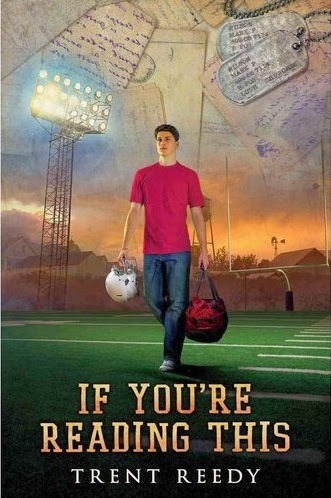 Huffman started his game company in 2013, and is trying to raise $28,000 by Sun., Sept. 28, 2014. He has already fronted the graphic design and other developmental costs. If funded via Kickstarter, the game is ready to go into full production. "My top priority is to deliver games that you'll enjoy playing, whether you are a history fan or not," he writes on his website. "But I do hope that you will learn a little bit about history when playing our games. I also hope that some educators will consider using our games as a framework for discussing history, particularly the leaders, battles, economics, and geography involved." Many British officers that would later play major roles in the American Revolution also fought in the Seven Year's War, with some of the younger officers in the American Revolution going on to fight in other British conflicts of the late 1700s. 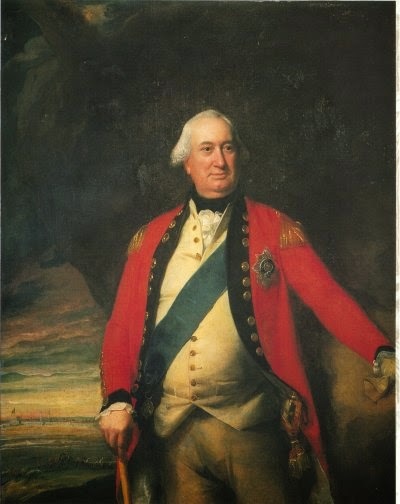 There are a few British generals that I find particularly interesting in terms of their legacies from this era. They fought in multiple wars and had very different results in each of them. Growing up in an American school system, our history books didn't really address parts of their careers that didn't deal with American history. Basically they get mentioned within the context of the American Revolution and that’s it. In his "spare time," the entrepreneurial Huffman is an Iowa National Guard signal officer assigned to 734th Regional Support Group (R.S.G. ), and recently spent time as a civilian contractor instructing on mission command systems. Huffman is a 2003 graduate of the Reserve Officers Training Corps program at the University of Iowa, Iowa City. "My love of military history was certainly a strong influence in my decision to join the military," he tells the Red Bull Rising blog. "My grandfather was also a medic in the 34th Infantry Division during WWII in North Africa and Italy, and that was always inspiring to me when I decided to join." And ... what about the war story regarding Pashtun poultry? "I was driving wearing N.V.G.s [Night Vision Goggles] during an operation to cordon an Afghan village, when a chicken flew at our Humvee, knocking out a tactical satellite that had been zip-tied to the hood and really hurting our communications during that operation." "That chicken," Huffman says, "was Taliban." In the current issue of GX Online, journalist and mil-blogger Susan Katz Keating delivers a fast-paced, fact-packed article about Korean War history that was inspired by her citizen-soldier father, Norman Katz. GX Online is an official magazine of the U.S. Army National Guard. Keating chronicles National Guard mobilizations including California's 40th Infantry "Sunshine" Division (40th Inf. Div.) and Oklahoma's 45th Infantry "Thunderbird" Division (45th Inf. Div.). Between Aug. 14, 1950 and Feb. 15, 1952, she writes, the National Guard contributed approximately 138,000 reservists to repel North Korea. Norman Katz was a member of the 40th Inf. Div., and a Purple Heart recipient. Troops fighting in Korea braved sub-zero temperatures, unforgiving mountain terrain, ubiquitous spies, and inferior supplies and equipment. One pharmacist veteran describes for Keating how he'd mix codeine into syrup, to suppress coughing that would give away their fighting positions. Another tells of being welcomed by a group of liberated Korean and Chinese prisoners of war while on a supposedly secret mission—informed by their former jailers, the prisoners knew more about the mission than the U.S. troops. The issue is available FREE as a PDF file here. 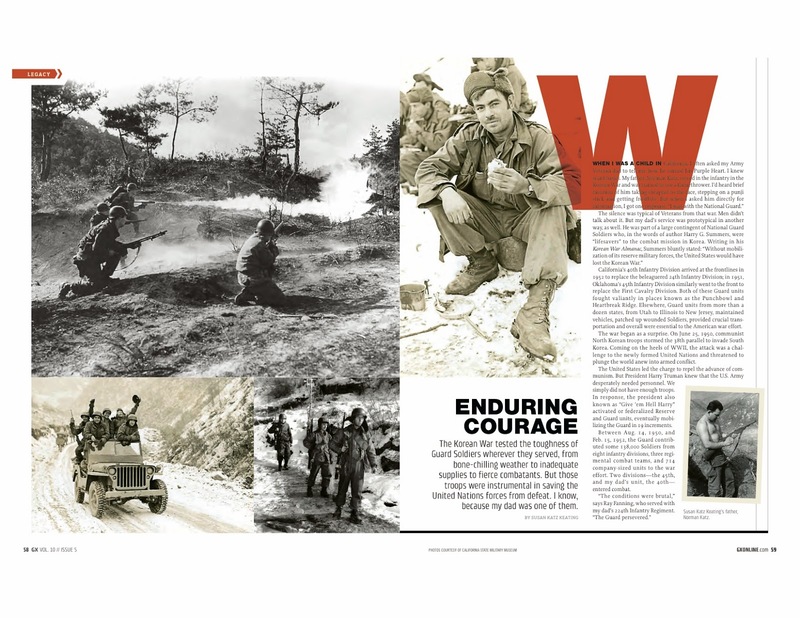 Keating's article, "Enduring Courage," appears on print pages 58-63, and PDF spreads 30-33. You can read her blog post about the GX Online article here. Her Facebook fan page is here. 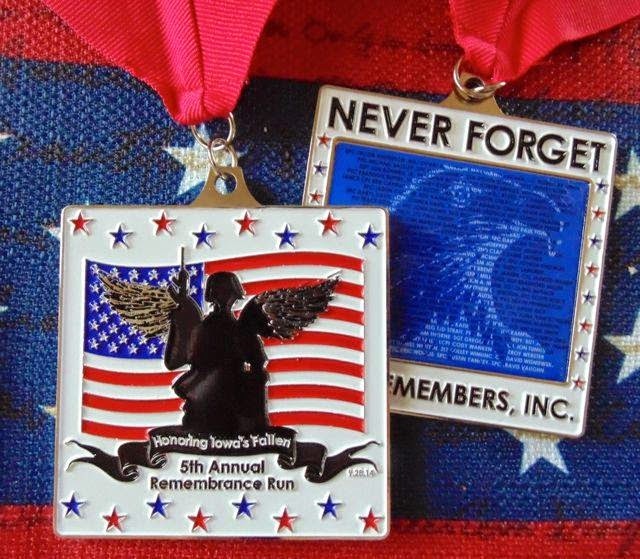 The Fifth Annual Remembrance Run will be held 10 a.m. Sun., Sept. 28, 2014 at Raccoon River Park, West Des Moines, Iowa. More than 800 registered runners participated in the 2012 event. Subsequent years have overtopped 1,000 participants. The run is a fund-raiser for Iowa Remembers, a 501(c)(3) non-profit organization. The organization helps underwrite an annual retreat for families of Iowans who have died as the result of service in Iraq and Afghanistan since 2003. The retreat is held in the Des Moines area on the same weekend as the run. Iowa Remembers maintains a list of honored dead. Prior to each year's race, that list is read aloud, along with either a performance of the U.S. National Anthem and/or recitation of the Pledge of Allegiance. At this year's event, Iowans killed during the Vietnam War will also be remembered. In a related event that evening, Iowa Remembers will also host "An Evening with Marcus Luttrell" at the Iowa Events Center, Des Moines, 7 p.m. Tickets are $45 plus a $1 facility fee, and may be purchased at the box office or website. On-line ticket sales fees may apply. Seating is general admission. 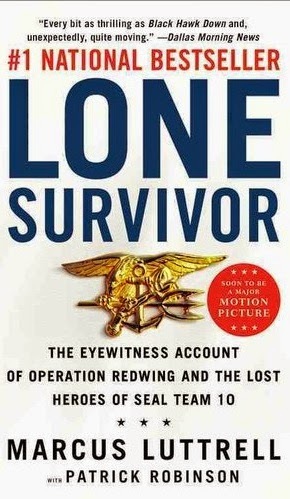 Doors open at 6 p.m.
Luttrell is a former Navy SEAL, and co-author of the 2007 best-selling book "Lone Survivor: The Eyewitness Account of Operation Redwing and the Lost Heroes of SEAL Team 10." Proceeds from the Luttrell event will also go to the annual retreat for military families. Registration for the Fifth Annual 5K walk/run event is $25 through Sept. 19. Late registration is $30 between Sept. 19-24 (with no T-shirt guaranteed). Both team and individual registrations are available. Children 12 and under can participate for free, but registration is required to receive T-shirt and medal. 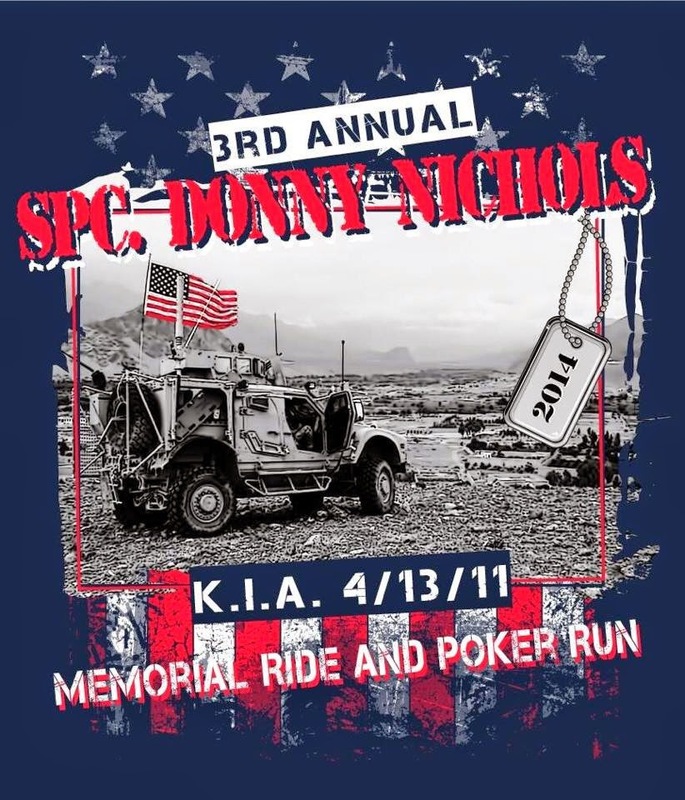 Team registration is available for groups that want to honor a particular soldier or individual. Registration costs are the same. Iowa Remembers maintains a Facebook page here. An event page for this year's Remembrance Run is here. An event page for "An Evening With Marcus Luttrell" is here. The Summer 2014 aesthetic of veterans-lit magazine Line of Advance is a bit punk, rough around the edges in a carefully curated sort of way. The gut feel is boosted by the Pepto Bismal pink cover, which features an ink drawing by Army Staff Sgt. 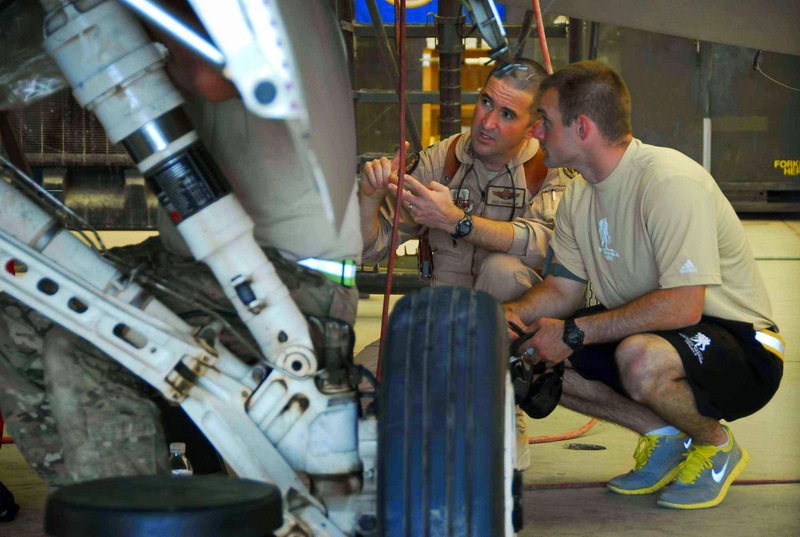 Daniel Kasza, a five-time veteran of Iraq, plus a trip to Haiti. 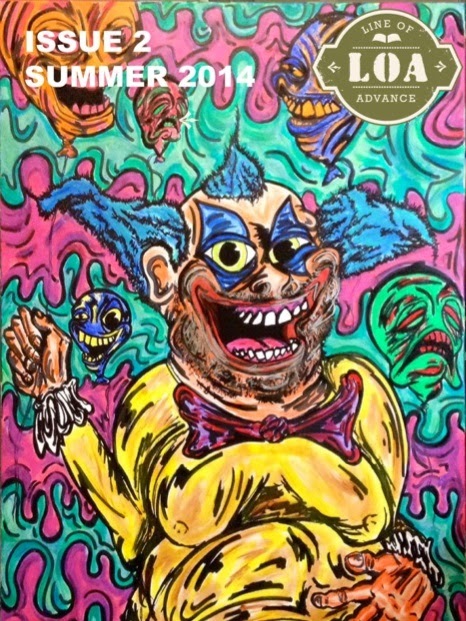 The drawing, titled "Disgusto the Clown," depicts the apparent love-child of R. Crum and a Juggala. It could easily appear adjacent to the dictionary definition of "grotesque": "Comically or repulsively ugly or distorted." In the background, some balloons are laughing, others are crying. What's all this have to do with the military? Read on. There are five stories and three poems presented in the publication's second issue, released in digital formats last week. Some of the short stories may be non-fiction—the editors have eschewed labels, or even a table of contents—but most seem to resonate with autobiographical authenticity. These are stories, written by soldiers and possibly for soldiers, even when they do not explicitly mention combat or service. Repeating a technique established in their inaugural issue, the Line of Advance editors have also peppered their pages with paragraphs from earlier writers about earlier wars. Not to worry, however: There is a strategy and craft at work here, rather than just padding the page count. (For the record, the issue weighs in at 72 pages, including the cover.) 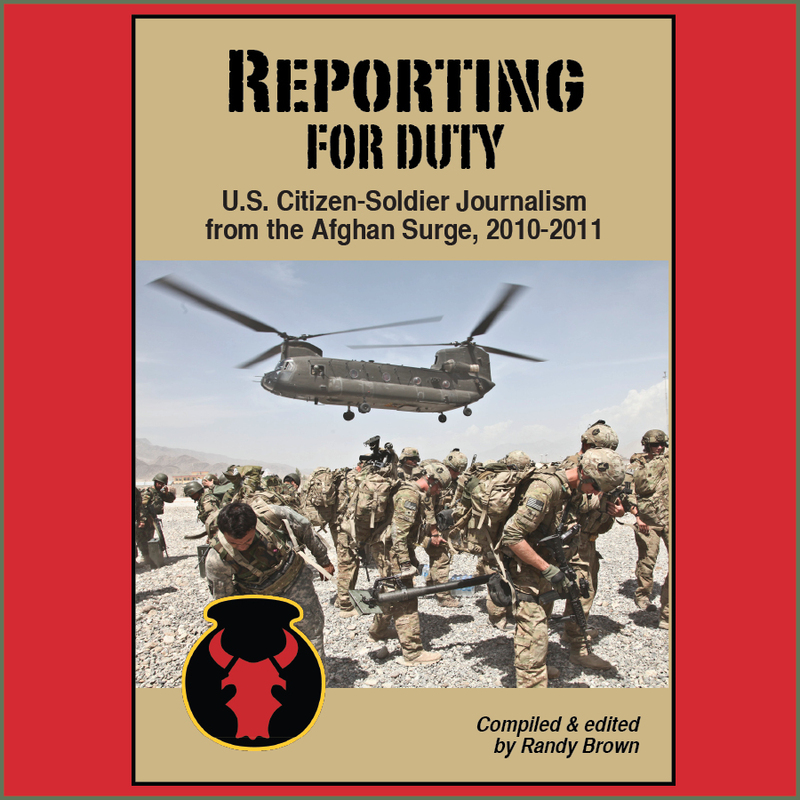 The interstitial pages add both grist and gravitas, and careful readers are rewarded with historical insights and experiences that resonate with present-day military life. In one example, Winston Churchill writes, "We are told that the British and Egyptian armies entered Omdurman to free the people from the Khalifa's yoke. Never were rescuers more unwelcome." [p. 28] Sound familiar? In another example: Xenophon of Athens notes, "[T]he point to consider is, how we may get the fewest wounds and throw away the smallest number of good men ..." [p. 35] Roger that. We need more thinking like this. The weighty classics also serve as touchstones to the 21st century writing featured in the issue. When George Orwell mentions an anecdote about a 12-year-old militiaman throwing a hand-grenade into a campfire "for a joke" [p. 53], for example, readers can make connections to the title of Mickey Tissot's short story "Obsessed with Spain," and also with Chris Whitehead's "American Soap." A guy in Frank's team wanted to cook some food so he walked over and found a good place to start a fire. He lights a little starter fire and starts prepping his food. Everything is fine until he sees the fire start to flicker in the wind. Luckily a few feet away there are some crates he can use to protect his fire. "That'll work," he thinks to himself. He stumbles over and picks up a box. It's kind of heavy. He weighs it in his hands. Absurdity and grotesquery are infused throughout the magazine: Former Air Force pilot David Buchanan tells a Hemingway-esque story ("The Colonel") of hunting alongside a murderous troll of a field-grade officer. Former sailor Travis Klempan relates a frustrating and familiar tale ("The Mule Whisperer") of waiting for Explosive Ordnance Disposal (E.O.D), in the company of an innocent animal. The story resolves suddenly and almost magically. 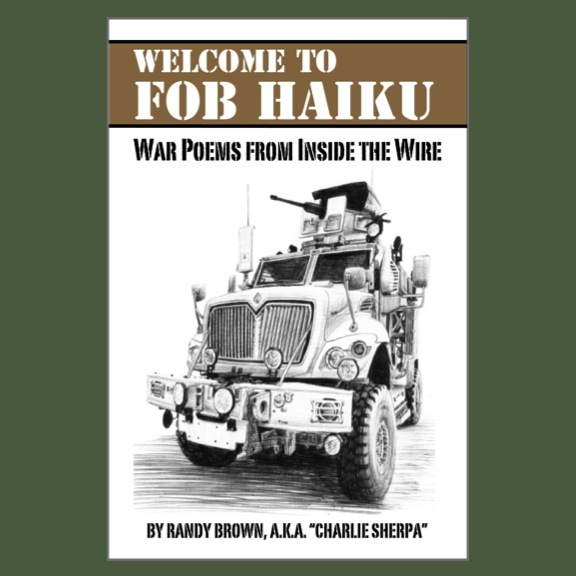 Poet David Pointer's narrator describes a journey from a home plagued by poverty and crime and dishonorable discharges, to proud peacetime Marine, to standing uneasy at the gates of Welcome Home. Anguish Cavanaugh begins a story ("The Blackness of Night") at Combat Operating Post Najil, Afghanistan, and ends confronting the Devil himself. "Later he felt the need to talk but no one wanted to hear about it. His town had heard too many atrocity stories to be thrilled by actualities. Krebs found that to be listened to at all he had to lie, and after he had done this twice he, too, had a reaction against the war and against talking about it." Line of Advance is right on target. Fire for effect. Tell your stories. 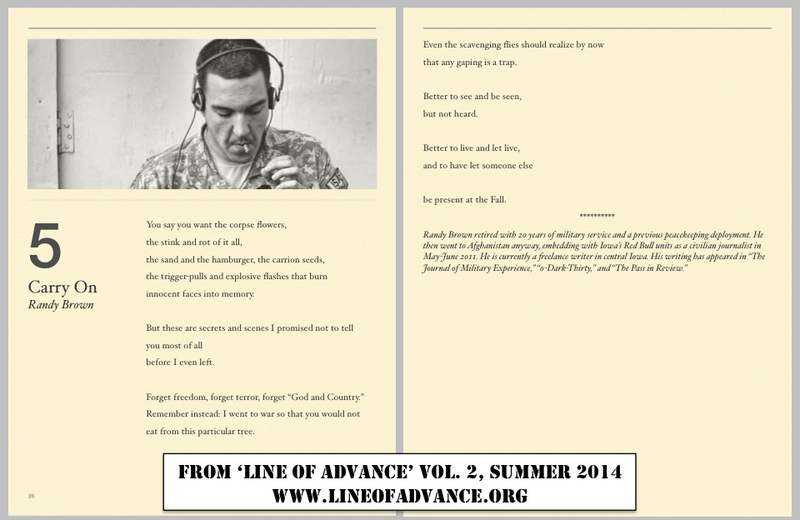 Disclosure: The writer of the Red Bull Rising blog also has two poems, "carry on" and "your convoy leader writes haiku," featured in this issue of Line of Advance. 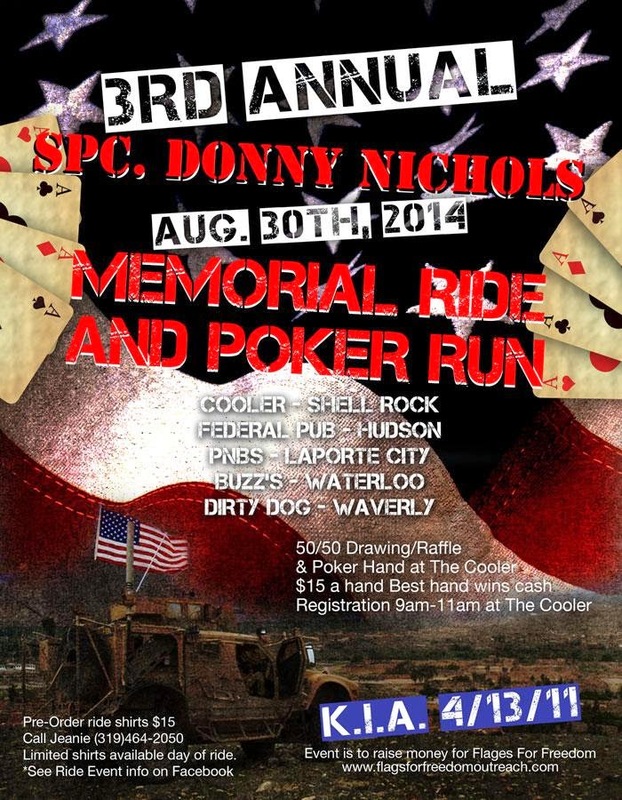 The 3rd Annual Donny Nichols Memorial Ride and Poker Run will be held in Eastern Iowa Sat., Aug. 30, 2014. The fund-raising event commemorates Iowa Army National Guard Spc. Donny Nichols, 21, of Shell Rock, Iowa, killed April 13, 2011 in Laghman Province, Afghanistan. The event will start and finish in Shell Rock. In 2010, Nichols was deployed with 2nd Brigade Combat Team (B.C.T. ), 34th Infantry "Red Bull" Division (2-34th BCT) in Eastern Afghanistan. Nichols was a member of Headquarters Company, 1st Battalion, 133rd Infantry Regiment (1-133rd Inf. ), which is based in Waterloo, Iowa. Each year, event organizers direct funds to military-themed projects. Proceeds from this year's event, for example, will benefit Flags for Freedom Outreach, a Lake of the Ozarks, Mo. non-profit that supports and remembers wounded soldiers during recovery and reintegration. Among other supporting groups, the 34th Infantry Division Association (34th Inf. Div. Assoc.) will staff a booth during registration for the ride. 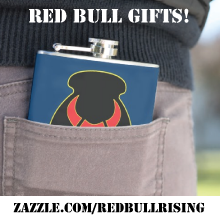 The organization will donate $5 for every individual who displays an item of "Red Bull" swag to booth personnel—stickers, tattoos, patches, association membership cards, flags, etc.—displayed by any poker run attendee or participant, up to a total of $500. While there, make sure also to register for a giveaway of two replica 34th Infantry Division flags! In a poker run, registered participants are dealt random cards. While many motorcyclists are anticipated, organizers emphasize that "all types of wheels" are welcome. At the final stop of the day, the participant with the highest poker hand wins a pot of cash. Raffles, T-shirt sales, and other fund-raising efforts will also take place during the event. Ride shirts may be pre-ordered and pre-paid ($15 each) by Aug. 22, 2014. Contact Jeanie at 319.464.2050. A limited number of shirts will also be on sale at the event. This year's T-shirts feature a red, white, and blue color scheme. On the front is a photograph of an Mine-Resistant Ambush Protected (M.R.A.P) All-Terrain Vehicle, the crew of which is proudly flying the American flag while downrange in Afghanistan. Registration is Sat., Aug. 30, from 9 a.m. to 11 a.m. at The Cooler, 201 South Cherry St., Shell Rock, Iowa. The ride will begin approximately 11 a.m. Start times may be staggered if numbers warrant. Each poker "hand" is $15, and dealt at The Cooler. There will also be a 50-50 raffle at the start and possibly (details pending) at the finish. Other raffle prizes will be awarded at the finish, time pending. For a Facebook page for the Aug. 30 event, click here.